WNY Mixed Martial Arts & Fitness is the greater Buffalo area's largest, most experienced, and most successful Mixed Martial Arts gym! We make it easier for you to train with two state of the art locations in North Buffalo and Williamsville. Housed inside a 13,500 square-foot facility, WNY MMA boasts a large grappling mat, a 20-foot MMA cage, a 16-foot boxing ring, a large striking area with bags, a dedicated fitness room with bags, a large kids area with bags, locker rooms with showers, and a fully stocked pro shop. At WNY Mixed Martial Arts & Fitness we train everyone from kids to adults, professional athletes to someone just starting to seek out a healthier lifestyle. No matter what your level of fitness or goals are, we are here to help—and we make sure that our facility provides everything you need to be successful. Our newest location is in the Eastern Hills Mall, conveniently located in Williamsville. With lots of parking, WNYMMA Williamsville is easy to find once you head into the mall. Use the entrance by Duff's and then make the first left. You'll head down just a few store fronts before you see WNYMMA on the right. Our Williamsville location is a beautiful, spacious, and modern training facility. Bright and clean, it's 7,800 sq. 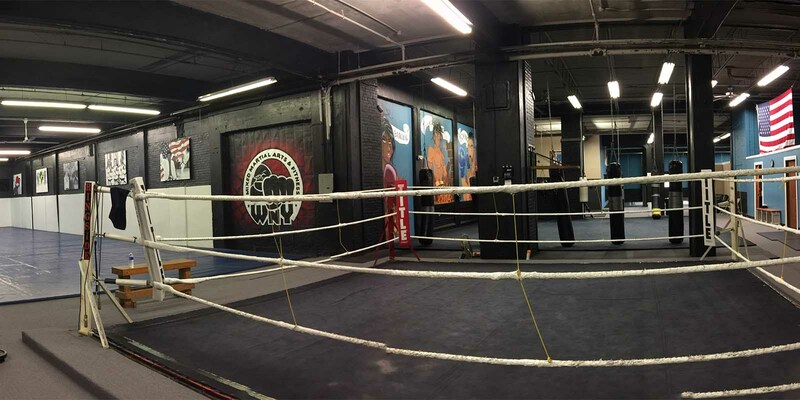 feet with a large grappling area, a boxing ring, high quality heavy bags, changing rooms, a Pro Shop where you can buy equipment and gear, and lots more. Come join us at either of our locations to get started working towards your training goals! We always say that WNYMMA offers countless training options in one training community - and now you have your choice of two training locations.